Try the coolants of our production, you will be happy. VIF cooling fluids are designed for all types of engines. It protects them from overheating in the summer, high frosts in winter and corrosion. The type of ANTIFREEZE BC is used for passenger cars as well as trucks with aluminum and cast iron engines. 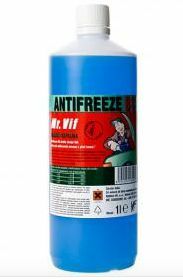 ANTIFREEZE D cooling fluid is designed for all types of motors, including all-aluminum. Contact us and choose a product that suits your car the best.